Almost as this book opens Swedish carpet dealer Carl-Iver Olsson is fatally stabbed while on a buying trip in Istanbul. Over the subsequent 400 pages Olsson’s life and the lives of his extended family and colleagues are picked apart to reveal the motivation and, ultimately, the culprit of the nasty crime. Along the way we learn a little about a lot of people including Olsson’s wife, his niece, her husband and the Olsson’s children as well as the policeman investigating the case, Claes Claesson, and his wife who, not surprisingly given the relatively small town they live in, is a colleague of Olsson’s wife at the local hospital. I was prompted to read this book after seeing this review and realising at least some of the story takes place in Turkey which is one of my favourite places to have visited. I even have fond memories of buying a lovely carpet there and so was keen to re-visit that world, if only virtually. The book has a great sense of location – quickly taking me back to the vibrant and exotic city of Istanbul but also depicting the small coastal community of Oskarshamn in Sweden (which I have not visited) (yet) with equal vividness. The mystery at the heart of the novel proves to be quite a simple one but this is one of those books where the journey from beginning to end provides the bulk of the book’s enjoyment as the author does not appear to be in any great hurry to reveal her secrets. Instead she introduces us to a cast of characters who are all connected to Olsson in some way, however tangentially that might be. Some lives, such as that of the tea-seller who discovers Olsson’s body, are only peeked into while others, such as that of Claes Classon and his wife Veronika, a doctor who is heavily pregnant as the book opens, are viewed in more depth. I suppose this meandering, somewhat domestic air to the book would not appeal to all readers but I found it engaging. The disparate lives are intertwined skilfully, with good use of different points of view and enough little nuggets of intrigue to keep me reading along. The author has also managed to gently insert her knowledge of hospital procedures (she is a doctor herself) and the world of fine rugs into the novel in a way that informs without seeming like a lecture. The characters are nicely drawn though there is not a huge range of personality types on show. Most people are…pleasant…with perhaps a minor character flaw or two but nothing truly ghastly (even the murderer is, ultimately, a bit bland) and most of the characters experience a bit of everything life has to offer…romance, angst, guilt, longing…but there are no grand passions on display. I’m not sure I would read all of the 6 other books about Claes Classon and his wife (this is the seventh book in a series but only the first to be translated into English) but I’d happily read a couple more. DEATH OF A CARPET DEALER is engaging novel at the lighter end of the spectrum and while it won’t set the literary world on fire it will bring pleasure and an intelligent read to those who give it a go. I suppose I have come to expect ridiculous typographical errors when it comes to eBooks but I grow weary of them. In this book one of the minor characters repeatedly appears as Karao?lu throughout the text of my copy (an ePub version of the eBook). Other non-standard characters (e.g.Ö and ç and é) appear quite normally so this repeated stuff-up really grated on me. eBook publishers have got to sort this crap out and soon if I am really expected to take them seriously. Book Series #7 in Claes Classon series. This entry was posted in book review, Karin Wahlberg, Sweden. Bookmark the permalink. Very apt review, Bernadette (& thanks for the link). I liked the discursive, “village gossip” style of the book, too, though like you I would not want to read too many of them in short succession. Good point about everyone being a bit “nice”, even the murderer. I suppose it makes a change from schlocky, slathering evil slimy types. I spotted a few proof/editing errors in my copy too. This book has fascinated me since I read prior reviews, especially the Istanbul setting, which pulls me right into the story. So I’ll look for it over here. I’m not yet into ebooks, but that may change, given that so many global books aren’t available in paper format. 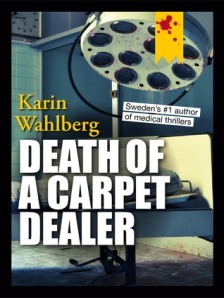 I’m ready for another romp in Swedish crime fiction and Death of a Carpet Dealer sounds like as good a place as any to start again. The exotic influences work for me. The fact it’s been translated to English is the deciding factor!